VietNamNet Bridge - To catch wild animals, hunters have to work at night and risk their lives along rivers and streams amid the jungle. With the agreement of a friend who is a Ma ethnic minority man, reporters recently visited a commune in the remote district of Da Huoai in Lam Dong province and began a night hunting trip. A group of six hunters told reporters that wild animals were getting more scarce and hunting at night was the only solution. The streams and rivers in the midst of high mountains and thick forest, tens of kilometers from hamlets, are the ‘workplaces’ of night hunters. Wild animals such as snakes and weasels often go looking for food at night along the riverbanks. So it is a reasonable time for hunters to do their work. The tools that hunters bring when going to the forest are modified Colt revolvers, special clips to catch snakes, nets and flashlights. To catch wild animals, hunters have to work at night and risk their lives along rivers and streams amid the jungle. After walking for 30 minutes in the jungle, the hunters entered the middle of a river section. The jungle was covered with darkness, and the flashlights on hunters’ heads were the only tool which helped them find the way. K’P, a hunter with tens of years of experience, said it was not an easy job because it is very difficult to travel at night, go through bushes and wade through rivers. He said one needs skills to discover animals in the darkness. Experienced hunters will find animals just with the light of a torch because they understand the special characteristics of the animals. Terrestrial animals such as jungle fowl or varan have eyes that show in light, while snakes’ tails are exposed at light. While everyone was busy tracing animals with torches, K’D, a member of the group of hunters, whistled, signing to others that he had discovered a wild animal. It was a python, about two kilos in weight, lying on a tree branch. K’D used the clip to catch the python’s head. The python, discovering the threat, tried to plunge into the water. However, the experienced hunters anticipated the move. 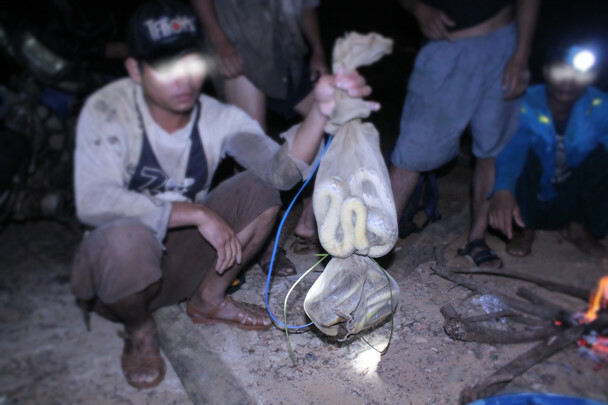 The three men waiting on the river later caught the python with their hands. The hunting trip concluded when many wild animals, from coluber to jungle birds, many of which are rare and endangered precious animals, were caught by the experienced hunters. More and more night hunting trips are being organized despite the high risks and legal violations. Rare animals are protected under conservation laws.